I am very excited to welcome Sophie Meyer to my blog today. 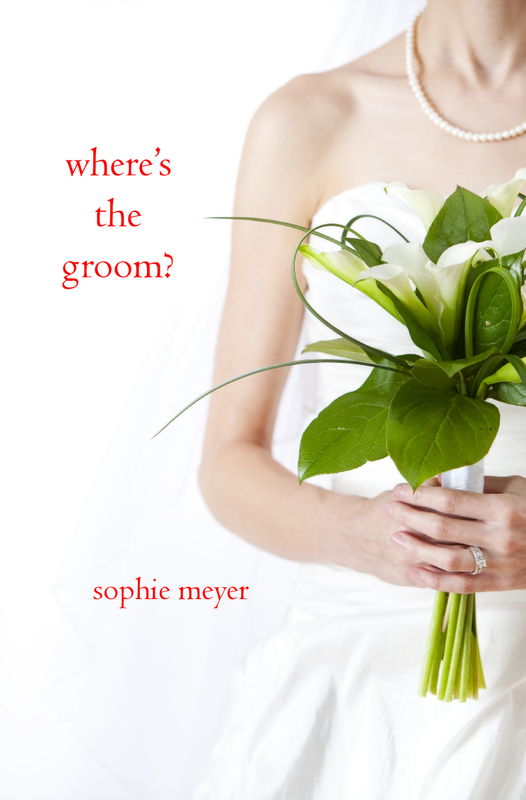 Sophie is the author of the enchanting new chick lit novel called Where’s the Groom. Sophie was kind enough to answer some questions about herself and her writing so read below for the answers and leave a comment for a chance to win one of five ecopies of Where’s the Groom!! Me: When did you know you wanted to be a writer? Sophie: I’ve been writing since I was about ten, and knew it right away. It’s who I am, natural to me. Once I started I never wanted to stop. Me: What inspired you to write Where’s The Groom? Sophie: I’ve been around so many women searching for love for so long – and am also very familiar with self-improvement workshops. It often occurred to me that it would great fun to do a novel about both of them…to see how these techniques really worked, take it to the limit. Can we really attract the man of our dreams by changing our consciousness? That was the question that spurred this book. Me: Are you working on another novel? If so, can you give us a sneak peak of what it’s about? Sophie: I am actually in the process of planning another novel, about star crossed lovers, who are always in the wrong place at the wrong time, until something dramatic happens that changes both of their destinies. It’s about soul mates and what is needed for them to be together at last. Me: What are some of your favorite books and authors? Me: What are your biggest fears as a writer? Sophie: My biggest fear as a writer is that people won’t enjoy what I write, that it won’t connect with others. Me: Who would you cast as Ashley in the movie version of Where’s the Groom? Sophie: I think Jennifer Anniston or Kate Hudson would be perfect as Ashley. Me: What would the story of your life be entitled? Me: What aspect of writing is easiest/most difficult for you? Sophie: The easiest part of writing for me is the enjoyment I receive from watching the characters develop as the book goes along. The most difficult part is marketing it – making sure it gets out there and is read. Me: Any advice for new writers? Sophie: I’d tell new writers to just sit down and write. Don’t edit, don’t hesitate. Let it all pour out. There’s a wonderful saying I heard about this, “You don’t know what you think until you see what you say”. Say it. Discover surprises. Then you can edit and shape it into what you like. Me: Me too! I love to hate it too 🙂 Favorite romantic comedy movies? Sophie: chocolate, chocolate and more chocolate please? Me: So… can I take it you like chocolate? If you couldn’t be a writer, what would you want to be? Me: Do you believe in the power of positive thinking as encouraged by Vince, Ray and eventually Ashley in Where’s the Groom? Sophie: I do believe in the power of positive thinking. I see how what we believe, hold in mind, and wish for ourselves goes out into the world and attracts all kinds of events and situations. Ashley, just turning thirty, is struck with a string of bad dates that keep getting worse. The last of her group of friends to be single, she’s quickly becoming hopeless about finding The One. When a friend convinces her to attend a new-age workshop on making your dreams come true, she gets onto a roller coaster she can’t get off of. The poignant and hilarious comedy of errors begins. The workshop sweeps through her life like a tornado and turns her reality upside down. She is told: visualize it, and he will come. Ashley takes it seriously, and before she knows it, she’s planning a wedding she can’t get out of. There’s only one problem: there’s no groom. Things quickly spiral out of control as one misunderstanding after another occurs, and Ashley’s friends and family become more and more involved and want to know who the groom is? Backed into a corner, Ashley finds herself having to make up one story after another as her wedding plans become more and more of a reality. Everything intensifies as Ashley chooses her bridesmaids and is caught in a whirlwind of looking for dresses, choosing a venue, finding a band, and a thousand other arrangements. Soon a date is set, invitations are sent out, and there is no backing out! As all this goes on, Ashley is desperately dating, hoping for The One to show up in time! The book explores love, dating, fantasies and a thousand crazy detours on the way. In a shocking ending with a twist, Ashley draws true love into her life in the most unexpected way. Sophie Meyer has been writing for years, and has always been in love with love. With a background in psychology, philosophy and theater, she’s helped many find love, avoid detours and climb out of inevitable pitfalls. The essence of her life and work are exploring the wonderful, spontaneous and unpredictable surprises life loves to provide. She also offers talks and workshops on finding and living a life of love. FOR A CHANCE TO WIN ONE OF FIVE ECOPIES OF WHERE’S THE GROOM UP FOR GRABS, SIMPLY LEAVE YOUR EMAIL ADDRESS BELOW!